If you're a pet owner looking for the latest veterinary information, Twitter is a great source. Here are 12 recommendations* for vets and clinics on Twitter who tweet veterinary health advice and invaluable pet tips. In addition, the vets tweet about pet behavior, animal rescue stories, cat and dog products and more. A number of the vets tweet about their own pets--from Dr. Patrick Mahaney who has a Welsh Terrier named Cardiff with a chronic health condition; to Dr. Arnold Plotnick and his cat Crispy who has the "brain of Einstein and the body of Buddha;" and Dr. Janet Tobiassen and her cat Barney... 2 greyhounds and... heck, you'll have to follow her, there's a whole menagerie. The vets are not above sharing a funny animal video, either. This post is a companion piece to a previous post, 20 People all Cat Lovers Should Follow on Twitter. I plan to follow it up with a post on pet behaviorists on Twitter. Note: the compiled list is not in any particular order. About: Janet Tobiassen DVM is the guide to Veterinary Medicine on About.com where she has written about veterinary medicine, pets and vet news since 1999. Dr. Tobiassen specializes in small animals. She is married with a son and daughter and lives on a farm. Pets: dogs, cats, chickens and geese. Interests: Loves making her own beads. Knitting. About: Shawn Finch DVM wanted to be a vet since she was 9 years old. She is a veterinarian at the Gentle Doctor in Omaha, Nebraska. She writes about pets at Life with Dogs. Married with 2 daughters. Interests: Involved with Nebraska Poodle Rescue and a supporter of Nebraska Humane Society. About: Dr. Arnold Plotnick is owner and Veterinarian of Manhattan Cat Specialists, a cats-only veterinarian practice. Known as “the Cat Guy since his studies at Penn, he is the medical editor of Catnip magazine, and writes the monthly “Ask the Vet” column for CatFancy magazine. He is on the editorial advisory board of the veterinary journal Veterinary Forum. About: Dr. Jessica Vogelsang has a long last name that no one can ever pronounce, so she goes by Dr. V. (I sympathize!) Dr. V practices medicine in San Diego, CA. She is a regular contributions to Studio One Network’s The Daily Cat and The Dog Daily. Her work has been featured on petfinder.com, in Modern Dog Magazine, and in Good Dog Magazine. She is married with 2 kids. About: Dr. Karen Becker is a Proactive and Integrative Wellness Veterinarian. She practices at the Natural Pet Animal Hospital in Chicago. Named one of Chicago's Top Ten Vets, according to Chicago Magazine. Pets: her home is "full of wayward pets, except one, a parrotlet." Interests: She says, "my hobby is my job." About: Dr. Lorie Huston has been practicing veterinary medicine for over 20 years. Lorie is currently the Feature Writer in Pet Care at Suite101.com and the National Pet Health Examiner at Examiner.com. Lorie also publishes the Voice of Pet Care newsletter. She is an SEO strategist. Interests: She does work for the Volunteer Services for Animals, a non-profit local group dedicated to helping pet owners and their pets. About: Marty Becker DVM known as "America's Veterinarian," is the veterinary contributor to ABC-TV's "Good Morning America," the resident veterinarian on "The Dr. Oz Show" and the pet expert for the American Association of Retired Persons. He is also a practicing veterinarian at Lakewood Animal Hospital in Coeur D'Alene, Idaho, and North Idaho Animal Hospital in Sandpoint, Idaho. Interests: He wrote Your Dog: The Owner's Manual: Hundreds of Secrets, Surprises, and Solutions for Raising a Happy, Healthy Dog . About: Dr. Patrick Mahaney specializes in pain management for pets. Spokesperson and advocate for nontraditional pet care. He is a Certified Veterinary Acupuncturist (CVA). Dr. Mahaney writes for Los Angeles Pet Care Examiner and PetMD. 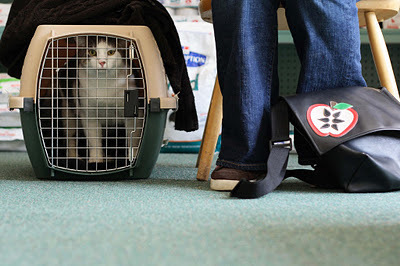 About: Dr. Shelby Neely is a veterinarian that has been in private practice seeing cats exclusively for over 20 years. She owns a feline-only practice in the Philadelphia area. She is the founder of Purrfectly Yours Adoption Center. About: Dr. Jeffrey Cohen owns the Newport Beach Veterinary Hospital, Newport Beach, CA. He is a Board Certified Specialist in Veterinary Medicine for cats and dogs. About: The Cat Clinic is feline-only veterinary hospital in Stillwater, OK owned by Dr. Annette Cowell. Pets: The hospital is also home and work place to Laz the cat who came back from the dead to save other cats as a blood donor for the clinic. I previewed Laz's amazing story in a previous post. Laz has his own Twitter account. About: Dr. Annmarie Hill, the owner, and Chief of Staff veterinarian for the Animal Care Center of Huntington Beach. Dr. Hill is married with two kids. If you're on Twitter love to hear your recommendations for vets that you follow. *Disclaimer: The information in this post is for educational purposes only and is not intended as an endorsement of medical services. That is one heck of a great list!!! Super, informative post and a marvelous list. I follow some of these and just added the rest. Thanks for the info!! believe it or not I think we are following nearly every one of them! How about next you do the 20 "best pet products" to follow on twitter! What a great idea for a post. I follow most of these vets and now I'll check out the rest. Cool list. I'm going to follow these guys now. :) Thanks! oh wow! Wonderful idea for a blog post! Thanks for writing! We're following most, but not all! Mommy interviewed Dr. Marty Becker for Animal Planet a few years back and (nepotism here) she had Ryker sitting in his arms the entire time! MOL!! Good information! Happy blog hopping! See? Now here's **another** reason the Human should be using her Twitter account more than once every six months! I don't have Twitter account but sounds like it's a great way to get information! Excellent list - fantastic vets to follow! Thanks for these helpful lists. I would agree, not only pets need a comfortable and affordable clinic but also humans. Clinics in Oceanside California is the best example of clinic that is helping people in case of emergencies. I've been looking for a good animal hospital in chicago, and I'll have to check the one you mention out. I've never heard of natural animal medicine before, but the idea appeals to me. If it's anything like natural medicine for people, I'm sure I will approve. Thanks for the list! I am really amazed and happy to read what you just said in here. Sometimes we have to go to Animal Hospitals even if there has some normal issues about our pet. So in this technological era twitter can be an option for veterinary information. Thanks a lot to save our time by giving us such information.